Published in The Hill Times (November 26, 2018). B.C. premier John Horgan discussed climate action during a meeting with Washington governor Jay Inslee in 2017. Photo: Province of B.C. Twelve years — that’s how little time we have to take serious action to protect our climate. If we fail to act now, the Intergovernmental Panel on Climate Change (IPCC) predicts catastrophic consequences, such as increasingly extreme weather, lower crop yields, declining fisheries, and higher rates of poverty. The findings of last month’s IPCC special report are dire enough to make an optimist want to stay in bed. The same could be said of the increasing political headwinds now facing climate solutions in Canada. Yet this is no time to despair — especially in British Columbia. Innovators across B.C. are leading the way and showcasing the exciting potential of clean economic growth in Canada. With the imminent release of the province’s new climate strategy, B.C. has the opportunity to be the shining beacon of hope for the future that Canada and the world need. B.C. isn’t starting from scratch. We have a track record of implementing world-class policies to fight climate-damaging carbon pollution and support a thriving economy. Under North America’s first revenue-neutral carbon tax and B.C.’s first climate plan, B.C.’s economy continued to grow while the use of motor fuel dropped by 17 per cent and carbon pollution declined by 10 per cent between 2008 and 2011. 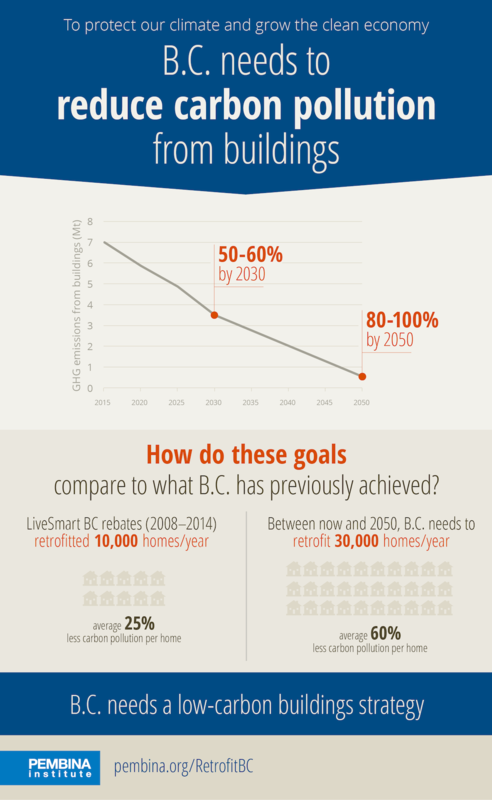 Beginning in 2008, B.C.’s LiveSmart rebate program spurred an uptick in energy-efficiency retrofits — reducing carbon pollution from homes and buildings, and stimulating job growth in the industry. Provincial climate action and moves towards a clean economy stalled between 2012 and 2017. Nonetheless, businesses and communities across B.C. continued to forge ahead with climate solutions. For instance, B.C. is home to seven of the 10 innovative Canadian firms named to the Global Cleantech 100 list for 2018. B.C.-based manufacturers are the country’s only suppliers of highly energy efficient, Passive House–certified windows. The municipalities of Vancouver, Victoria, Nelson, and Slocan, as well as the Regional District of Central Kootenay, have committed to work toward seeing their communities powered by 100 per cent renewable energy. In Surrey, organic waste is being converted into carbon-neutral biomethane that fuels waste collection trucks. Metro Vancouver also produces biomethane from two landfills. Let’s be clear — tackling the climate emergency will involve plenty of heavy lifting. But British Columbians have the skills and experience for the task. What we need are a strong climate strategy, programs, and policies to get B.C. back on track to achieving our legislated targets for reducing carbon pollution, especially from buildings, transportation, and industry. Bringing down carbon pollution from the building sector is one of the big jobs ahead. Indeed, retrofitting existing homes and buildings to save energy and curb emissions should be B.C.’s next megaproject. We’ll need incentives to spur upgrades to more than 30,000 homes a year, which will also result in better air quality, lower heating bills, and healthier living spaces. While electric vehicles are increasingly a common sight on the roads, a top priority for the transportation sector must be to lower carbon pollution from the movement of goods, including the delivery of online purchases, groceries, and supplies. We also need a strategy that curbs emissions from all industrial sources. It’s far from clear how liquefied natural gas (LNG) developments will fit within B.C.’s carbon budget. The climate strategy should be underpinned by a roadmap to produce more renewable energy, stimulate clean economic growth, and boost innovation in B.C. A smart mix of policies and incentives can help B.C. businesses position themselves at the forefront of the global low-carbon transition, scale up their products and services, and grow their expertise and exports. Energy conservation is an important part of the way forward, but the fact is clean growth will demand additional renewable electricity. We need a plan to identify and develop further sources of clean energy, including wind, solar, and biofuels. Finally, to ensure B.C. stays on track to our targets for 2030, 2040, and 2050, the climate strategy needs a transparent and enforceable accountability mechanism. We should add teeth to the Climate Change Accountability Act. B.C. is ready to light the way to renewed climate leadership and a clean and prosperous economy. Let’s show Canada there’s plenty of reason to be excited about our clean future. Karen Tam Wu is the B.C. director at the Pembina Institute, Canada’s leading clean energy think-tank. This op-ed originally appeared in the Hill Times on November 26, 2018 (page 11).